With so many indelible moments that made up this 2013 Stanley Cup winning season for the Chicago Blackhawks, I’ve compiled a list to what was truly important about this championship run. Some things you may remember, some things you may have forgotten about, all of them should be taken into account when thinking about what made this Hawks season special. Let’s take a look back. Blackhawks vs. LA Kings — After the end of the lockout and a week long training camp, NHL hockey was back and it didn’t take long to explode. Before this season opener, the Los Angeles Kings raised their banner from 2012 in a ring ceremony but once the puck dropped, the Hawks took advantage of the Kings’ fatigue and slow start to deliver a 5-2 victory on the road. The Hawks netted goals from Patrick Kane, Jonathan Toews and Marian Hossa and made Kings goalie Jonathan Quick — who being handed the 2012 Conn Smythe Trophy last time we saw — look ordinary. Little did we know that this offensive showcase would be a preview of things to come. San Jose Sharks vs. Blackhawks — After trailing 1-0 in the 2nd period, the Hawks recieved goals from Viktor Stalberg and rookie sensation Brandon Saad to seal a 2-1 victory in front of a soldout United Center crowd that witnessed history, as the Hawks made their mark by setting a record for consecutive games to start a season without a regulation loss (14-0-3). Detroit Red Wings vs. Blackhawks — This contest was set as the last regular season meeting between these Original Six and Western Conference division rivals. A back and forth affair, this game took a dramatic turn when Hawks captain Jonathan Toews tied the score at 2-2 late in regulation sending the game into overtime. After the extra period, this game fittingly ended in a shootout and Brandon Saad sealed it with the deciding goal. This game acted as a great precursor to the final series these teams would play before Detroit’s exit to the Eastern Conference just a month later. Colorado Avalanche vs. Blackhawks — With their historic streak at an all-time high, the Hawks received their toughest test from the young upstart Avalanche. Trailing 2-1 to start the third period, the Hawks displayed their championship mettle with a shorthanded goal from Jonathan Toews and a score by Daniel Carcillo, the eventual game winner with just under 50 seconds left in regulation. The 3-2 victory gave the Hawks an unbeaten streak of 24 games to start a season without a regulation loss (21-0-3), the current NHL record. The streak would come to an end two nights later in Denver. Nashville Predators vs. Blackhawks — With the regular season drawing to a close, the Hawks organization honored long time broadcaster Pat Foley before the game for his 30 years of service to this historic franchise. Foley’s Hawks career began in 1980, he has gone on to announce over 2,400 games, describing the action nonstop while detailing the deeds of some of the Hawks greatest players, among them Denis Savard, Chris Chelios, Jeremy Roenick, Tony Amonte, Jonathan Toews and Patrick Kane. Foley’s signature calls, including “He shoots, He scores!” in his high pitch voice, “Big Save!” and “Hawks Win!” can be easily identified by any Hawks fan. This honor was long overdue after Foley’s being let go in 2006. Thank goodness that owner Rocky Wirtz brought Foley back for fans to enjoy prior to the 2008-2009 season. As for that night’s contest, the Hawks upended Nashville 5-4 in overtime, the game winning goal provided by Marian Hossa. This game would be featured in this year’s television installment of NHL 36, which followed the Hawks behind the scenes as they prepared for the playoffs. Blackhawks vs. Dallas Stars — The Hawks displayed their dominance over the young Stars in Dallas with a 8-1 victory. On this night Patrick Kane would show why he’s one of the top players and showmen in the NHL. With the game out of reach, Kane showcased his version of the Spin-O-Rama in which he scored his goal. Former Hawk and current ambassador Denis Savard would be very proud of Kane’s talent and creativity on that one. Blackhawks vs. Red Wings — As the Hawks continuinued their historic streak, nothing would have been better for Detroit than to have the Red Wings snap the streak on NBC at Joe Louis Arena. With Detroit taking a 1-0 lead early in the third period, this playoff-like contest would take an epic turn as Patrick Kane scored on the power play late in regulation, tying the score at 1-1. If that wasn’t enough, Kane displayed his nifty moves on Red Wings goaltender Jimmy Howard and netted the only goal of the shootout, giving the Hawks a 2-1 win. The streak increased to 22 games. Game 5 of the Western Conference Finals, as much as any game this season, showed the Hawks’ resolve as a team as they closed out the defending champions. After taking an early 2-0 lead, the Kings showed no quit and crawled back into the contest. Even with the Hawks scoring late to make it a 3-2 after LA’s rally, Kings’ forward Mike Richards, who missed most of the series with an concussion, tied the game late in regulation with ten seconds remaining. It would take nearly two entire overtimes before would come to a close as Patrick Kane closed out his second career playoff hat trick and the Hawks clinched their second trip to the Stanley Cup Finals in four years. Red Wings vs. Blackhawks — Trying to comeback from being down 3-1 in the Western Conference semifinals versus the Detroit Red Wings, Game 6 was of course an important contest for the Hawks to grab. It was also important for Detroit, their last assured chance to eliminate the Hawks on home ice. The Hawks started off well, but the Red Wings took a 2-1 lead into the third period. With 20 minutes potentially left in their season, the Hawks responded like champions, scoring three goals, including a penalty shot goal from Michael Frolik, who became the first player in NHL history to score two playoff goals on penalty shots. After giving up a soft goal in the second period, Hawks goalie Corey Crawford held down the fort to help preserve the victory and up a Game 7 showdown. Game 7 played out like your typical classic playoff game. The Hawks grabbed an early 1-0 lead, which lasted until Detroit tied the score at 1-1 early in the third. An enormous turn was taken in this defensive struggle when Hawks defenseman Niklas Hjalmarsson scored what seemed to be the game winning goal with under two minutes remaining, but off setting penalties would be called which wiped out the goal. Overtime played out with a Hollywood ending for Hawks fans as Brent Seabrook scored the game-winning goal, sending the Red Wings fishing and into the Eastern Conference with a 2-1 victory for Chicago. The sellout crowd at the United Center witnessed history and this series, I believe, will go down as one of the best playoff series in recent memory. The 2013 Chicago Blackhawks for the first time in franchise history came back from a 3-1 deficit to win a series. Bruins vs. Blackhawks –– Trailing 2-1 to the Bruins in the Stanley Cup Finals, the Hawks responded by winning the next two games, which set up Game 6 as a coronation to their storybook season. Before the game’s amazing end, the Bruins controlled the pace and took a 2-1 lead late in the contest. Game 7 in Chicago was beginning to seem inevitable, but as they have done throughout the playoffs, the Hawks would showed their true character with the game on the line, scoring two goals within 17 seconds of each other and Dave Bolland putting in the game winner. Bolland would make history, his game winner being the latest goal scored in regulation to clinch the Stanley Cup. The 2010 Final produced a great clinching moment, but this year’s Game 6 will go down as one of the most unbelievable momentum turns in Stanley Cup history to clinch a title. 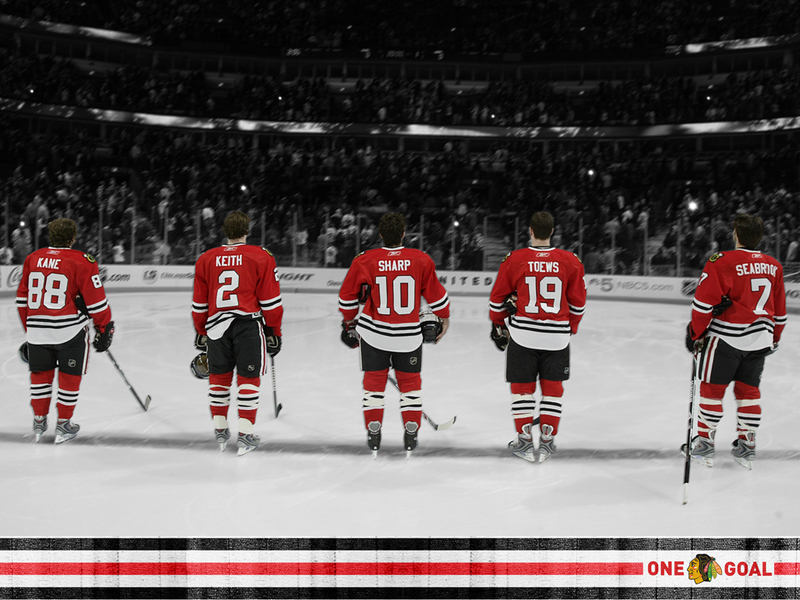 From January 19 to June 24, the Hawks provided memories that will last a lifetime for fans and Chicagoans in general. The bar has been raised by Hawks management and how by the fans and the players have responded to this success. The 2010 season was about resurrection and the redemption the franchise gained from its dark past, 2013 should be remembered as a moment of sustained excellence and where we all learned not to count this team out when it is faced with difficult obstacles. What will the future hold for the Hawks with the bar now permanently set at championship height? Seems like the Hawks should prepare for bigger and better things to come.